via Super Bowl XLV: Fame, celebrity and precedents from ancient Greece and Rome | ESPN. The ancient Greeks set the precedent. Admittedly, a mini-season of tragic plays in the fifth century BC didn’t attracted 153 million viewers, but we know that it mattered. The Athenians crammed as many as 20,000 viewers into their outdoor theatre, an assembly unmatched in those days by anything other than warfare, the scholar Simon Goldhill likes to point out. Instead of the countless hours of football pregame shows, there was the parade and sacrifice to the god of wine, Dionysus — a sign that the Athenian populace was about to binge. (Think beer, chicken wings and pizza). A Jan. 24 letter from University of Maine President Robert Kennedy to Faculty Senate President Michael Grillo indicates that three majors — Latin, German and women’s studies — are a step closer to the chopping block. The petition features influential signees, including former UMaine President Peter Hoff, former Maine Secretary of State Matthew Dunlap, Yale University ancient history professor Donald Kagan, British classical scholar Peter Green and Irish classicist and philosopher John M. Dillon. It also features the signatures of a number of UMaine professors and students, as well as from individuals in Asia and Europe. “Basically, it’s just a network of history professors, classics professors, [people from] various departments, well-wishers — a lot of connections,” Swist said. Dean of the College of Liberal Arts and Sciences Jeffrey Hecker said the wording of the petition could be somewhat misleading, directing signees to make untrue assumptions about the situation. Hecker said the notable scholars on the list make him take the petition “very seriously,” but the misconceptions in the letter and the current budgetary situation override their pleas. Last semester, the faculty senate passed a resolution to support recommendations made by the four-person Program Creation and Reorganization Review Committee to continue with Kennedy’s suggestions to suspend bachelor’s degree programs in theater, forest ecosystem science, wood science and technology, and aquaculture made in April 2010. However, the PCRRC also supported a one-year delay of April’s final recommendations by Kennedy to suspend majors in German, Latin and women’s studies. Those involved directly with the Latin and classics fields are wondering how a major with one administering faculty member, Associate Professor of Classical Language and Literature Tina Passman, and a mere six degree students would save enough money to warrant the axe. Hecker said the decision to eliminate the major was strictly based on low enrollment and student retention. 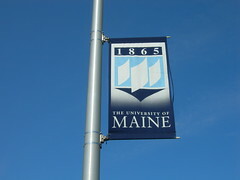 There are currently six students majoring in Latin at UMaine. In the last six years, Hecker said, there have been anywhere from zero to six students seeking majors in that field. Only one student in the last five years, he said, earned a Latin degree. Lower-level courses, he said, have “reasonable enrollment” and are viable options to be kept. “In essence, by retaining the major, we are committing Dr. Passman’s time to do that in the future. When I looked at it, it’s very hard to justify that resource for such a small number of students,” Hecker said. She said she does not understand why Kennedy would move to suspend the major now, as she has tenure and will not be asked to stop teaching even upper-level Latin courses due to the retention of a Latin minor. “There’s not one cent that is saved — not one cent — by eliminating the Latin major,” Passman continued. Passman said Hecker has been very supportive throughout the process and that he does not want to burden her with teaching Latin, as she also teaches classics and will serve as the director of the minor in peace and reconciliation studies next semester. Jay Bregman, a professor of ancient, intellectual and jazz history, echoed Passman’s sentiments about cost-savings and was strong in opposition of Kennedy. In 2001, Bregman said, Kennedy wanted to eliminate German and Latin to much opposition from faculty. Phi Beta Kappa, the history honors society, threatened to leave because of a bylaw within its national guidelines at the time that said any university with a chapter had to have a Latin major, he said. Bregman called Kennedy “by far the worst president I’ve ever seen at this university by a mile.” He also said the president has moved the university in the direction of a technical school. Michael Palmer, also a professor of political science who teaches political philosophy, wrote that until now, he has “never seen liberal education held [in] such low repute” at UMaine. Bergman said the effects of losing the Latin program at UMaine could have a devastating impact on state education. Passman said there are approximately 60 high school Latin programs in the state. She said she would continue to work with these programs and deliver her classes online, a process made easier as she converted her curriculum into an electronic format in the late 1990s. Kennedy, through UMaine spokesman Joe Carr, declined a request for comment, citing time constraints. A Trireme in Hudson Bay ??? Trireme in New York City Inc, a US-based group of history buffs, is trying to raise the $3 million it will take to get an ancient Greek warship sailing in Hudson Bay for the 2012 tall ships festival on July 4, the Wall Street Journal reported. A replica of a trireme — a galley deployed by the Greeks in the Persian War in 480 BC among other Mediterranean armies — already exists in Greece. The Olympias was constructed by the Greek Navy in 1987, but it hasn’t been sailed since 1993, when it was taken to London. The Olympias also carried the Olympic flame prior to the 2004 Athens Games. The replica of the 5th century BC vessel has 170 oars and is the fastest human-powered vessel on the planet. Trireme in New York City Inc hope that they will be able to recruit the 170 oarsmen or oarswomen needed to propell the vessel, to return the Olympias to sea-worthy condition and to carry out the necessary repairs and trial runs before the ship is transported to New York head of the 2012 tall ship regatta. According to the American group’s website, it has already received approval from the Greek Navy for the project and is in talks with the Seaport Museum in New York to dock the ship for a temporary exhibition on Athenian maritime history, featuring artifacts and items on loan from the Greek government. The company is headed by Markos Marinakis of Marinakis Chartering, Ford Weiskittel of the Trireme Trust USA, Dr George Tsioulias of the Hellenic Medical Society of New York, Edward Kelly, Maritime Associate of the Port of NY and NJ, Joseph Hughes, Vincent Solarino and George Tsimis of the Shipowners Claims Bureau, and Charles Hirschler also of Trireme Trust USA. For more information on the event or the terms of participation, log on to www.trireme.org. But a wreck of a trireme—a nimble vessel tipped with a bronze battering ram—has never been found. Classicists have had to piece together clues about its design from vase images, carved reliefs and bad jokes in ancient plays, generating competing theories about its size, structure and speed. In the 1980s, a Cambridge classicist and the chief naval architect for Britain’s Ministry of Defense pooled their knowledge to build a full-scale model of a possible structure for the trireme. Construction was funded by the Greek government. The ship was around 120 feet long, weighed 55,000 pounds and relied on an additional 33,000 pounds of crew for ballast. But the ship hasn’t stood the test of modern time. It is currently unfit for sea travel and is on display in a naval museum in Athens. It won’t be easy. The ship needs about $275,000 in repairs. It will have to be carried to the U.S. aboard a freighter. Rowers must be recruited. Scholars say it will be worth it. New trials will improve knowledge of the speed and agility of the ships, generating data that can be used to develop computer models of ancient battles. Trireme fans also hope to overcome popular misconceptions about the ships. “Forget about ‘Ben-Hur’ and the shackles and the guy with the whip,” says Mr. Hirschler, who participated in several of the ship’s voyages and keeps a 13-foot, 10-inch oar strapped to the staircase well in his Manhattan residence. Instead, he says, imagine a flutist or piper serenading 170 mostly free men to keep their strokes in rhythm. A “trierarch” oversaw the ship and funded the voyage. “He is the Steinbrenner of the deal,” says Mr. Hirschler, who notes that in ancient times, the trierarch would seek to poach better rowers through an active free-agent system. “The Athenians rapidly became the Yankees,” he says. Trireme fans can be an impassioned bunch. In 1975, an article in the The Times of London suggested triremes had been powered primarily by sails. Others vehemently disagreed, setting off one of the longest letter-writing exchanges in the newspaper’s history, as engineers, rowers, and classicists poured in their opinions, arguing over possible speeds and the number of levels in the ship. The debate continues. This month, John Hale, director of liberal studies at the University of Louisville and himself a rower, presented a paper to the Archaeological Institute of America, arguing the Olympias is “quite different” from the triremes of ancient Greece. Based on his interpretation of evidence, he says the classical ship had only a single mast (the Olympias has two), lighter construction and possibly oars of different lengths. Despite what he considers its flaws, the reconstruction “is a great achievement,” Mr. Hale says. He first encountered the Olympias when it was no more than a section of a ship erected on the lawn of its creator, Cambridge classicist John Morrison. “The oars were pulled through water in a circular plastic swimming pool,” he says. The ship “has had a major impact on the study of Greek history,” Mr. Hale says. Barry Strauss, chairman of the history department at Cornell University, agrees. He has visited the trireme several times for his research—and found it “hot and cramped” and “stinky.” He is also a rower, and would jump at the opportunity to join the crew. Total cost of the project is about $3 million, when an associated exhibit and conference are worked into it.